At a 1970's reunion of aging Follies chorines, two of the "girls" have a chance to reexamine their lives, and especially their marriages. Did they marry the wrong men? The answers begin to emerge when the ghosts of their former selves lead them back into the Ziegfeld-like Loveland, where everybody "lives to love" and "loves to live." Includes the songs "In Buddy's Eyes," "I'm Still Here," "The Girls Upstairs" and "Losing My Mind." Absolutely wonderful production of one of the greatest Broadway musicals ever! Top notch book and score right out of the gate - but everything about this production is first rate. The acting, singing, dancing, staging, costumes, sets and lighting are all terrific. I have been an avid Broadway goer since the early 70's, and many, many shows come and go - - - including classics that suffer from a poorly conceived new production. 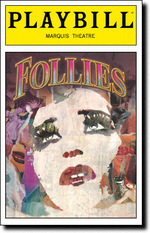 FOLLIES is a classic with an all-star cast AND a superb new production. SEE THIS SHOW!